Applications for an empty seat on the Santa Monica-Malibu Unified School District Board of Education are submitted, the interested candidates were by a subcommittee on Jan. 5, and their eligibility determined after press time. The seat was vacated by Ben Allen, who was elected to the California State Senate on Nov. 4. Allen then resigned his position on the SMMUSD board, starting a 60-day clock to fill the hole on the board. The six members currently on the board will vote for Allen’s replacement on Jan. 15 in a public meeting. Board member Craig Foster of Malibu said he’s looking for a candidate that has the interest of the Santa Monica and Malibu students in mind. “Clearly, I’m going to be looking for somebody who shares that vision that we need to make every decision focused on what’s best for the kids,” Foster said. A total of 11 candidates submitted applications for the open school board seat. Three of those candidates — Patty Finer, Ralph Macher and Dhun May — ran for the school board in the November general election, but lost. Finer is putting her hat in the ring for the seat again because she feels she has a place on the board, and was not discouraged by what Foster said. Finer already sits on the Visual and Performing Arts Advisory Board for the school district, a position she said she would keep regardless of the results of her candidacy for the open seat on the board. Among the issues Finer believes are important to the SMMUSD are possible polychlorinated biphenyls (PCBs) in both city’s schools. PCB is a chemical which has been shown to cause a variety of adverse health effects including cancer, according to the Environmental Protection Agency. Finer believes the PCB issue is not on the radar of the school board. Another candidate in the running for the open school board seat is Jake Wachtel, a teacher and former tennis coach from Santa Monica who co-founded THREADS, a nonprofit organization that donates clothing to families in need. Wachtel said he was the only cross-district candidate, and feels his experience in education and media would be valuable to the board. The public meeting on Jan. 15 will subject the 11 candidates to questions by each of the six board members. Foster said the appointment will likely be made that night or soon thereafter. The main issue facing the school board is the notion of separating Santa Monica and Malibu into their own independent districts, Foster said. The issue has been a point of contention for the past four years. “I think the best thing that the school district can do to help Malibu schools would be to continue the process that’s in place to put together the thorough understanding of what the two districts would look like independently and…move forward to create those two independent school districts,” Foster said. Foster is president of the Advocates for Malibu Public Schools, an organization that is working on separating the two school districts. Finer said she would support separating the districts, but only if it was economically feasible. If the board members do not agree on a candidate during the meeting, they would be forced to try again in a few days, Foster said. If no one is selected after the second vote, a special election would then occur, which Foster said would cost anywhere between $200,000 to $1 million. 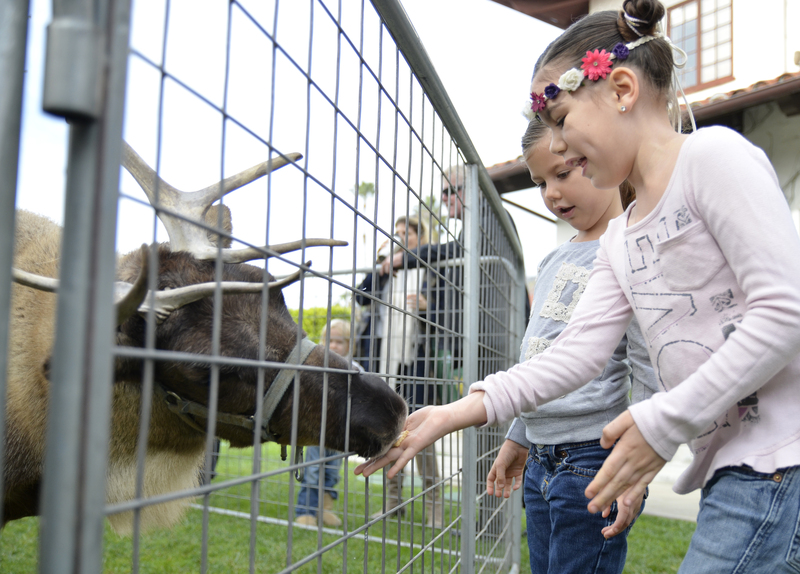 Bailey (right), 7, and Dylan Gilroy, 5, feed a graham cracker to a reindeer Saturday, Dec. 20, at Malibu Country Mart. 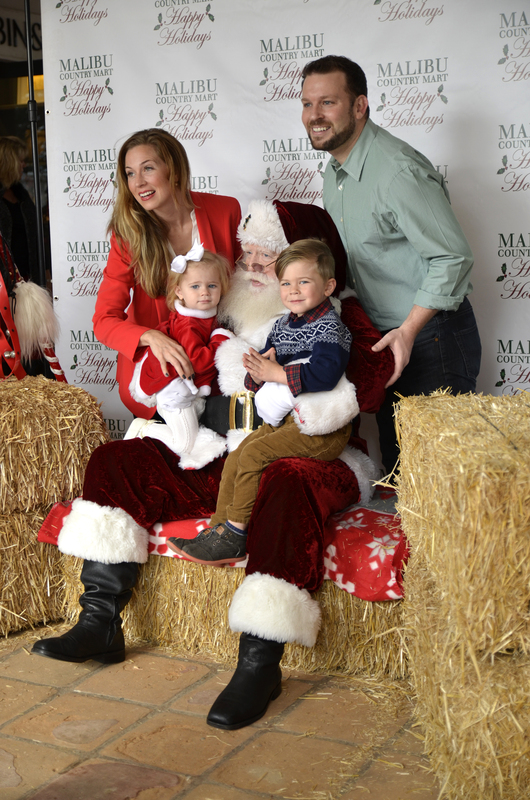 Several families with their children got their pictures taken with Santa and Mrs. Claus, as well as fed graham crackers to two reindeer, at Malibu Country Mart on Saturday, Dec. 20. The reindeer were in a circular cage and many children pet and fed the reindeer. Children also waited in line with their families to sit on Santa’s lap and have their photo taken. Four carolers sang holiday songs to entertain those standing in line, as well as those positioned elsewhere in the shopping center. The singers stood near the Santa area, the reindeer cage and in front of the decorated Christmas tree. 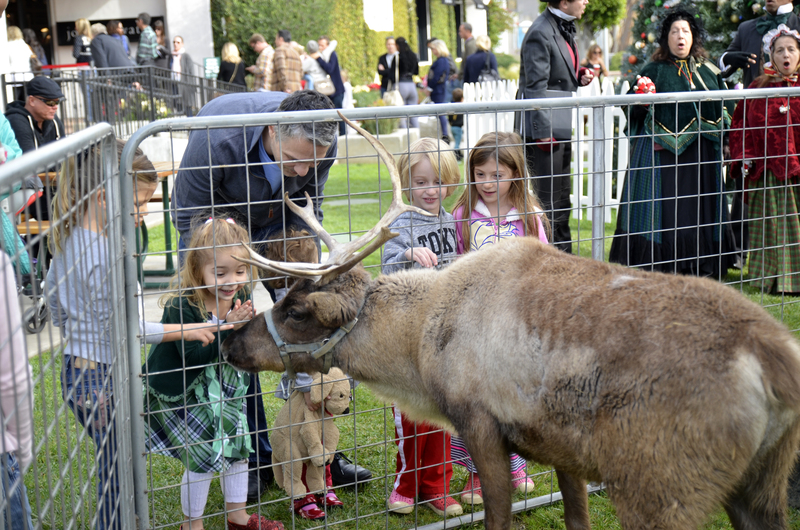 The event went from noon-4 p.m.
Children gather around a pen to pet a reindeer. Stacy (left to right), Emma, 1, Graham, 3, and Greg McNeal pose for a picture with Santa Claus at Malibu Country Mart. PALIHI — Santa Monica High School Vikings head coach Travis Clark can add another notch on his beat-Palisades-at-all-costs belt. And with that, Samohi (2-0) routed the Palisades Charter High School Dolphins (1-1) 44-15 Friday night on the road. Both teams sputtered early, each turning the ball over once in the early minutes of the first quarter. But the Vikings soon hit their stride, scoring two touchdowns late in the frame for a 13-0 lead. Samohi’s dominance continued in the second with another two touchdowns, one coming off an interception by senior Kevin Persons, who had two picks for the game. Within the first three minutes of the third quarter, the Vikings continued their offensive onslaught with the first of two touchdowns by senior wide receiver De’Jai Whitaker. Samohi’s defense left Pali scoreless in the third quarter and allowed only 15 points for the game. Pali head coach Tim Hyde felt their difficulty scoring was due to Samohi disrupting their game plan. Samohi senior running back Kwame Duggins chipped in with 100 rushing yards of his own. Dolphins senior running back Joseph Velez ran for 155 yards. Clark said he came into the game “planning on playing a couple of quarterbacks” due to junior quarterback Nico Basile’s ankle injury he sustained during their last game against the Redondo Union Sea Hawks. “I was hoping to be able to get through this game with the other two guys and that’s exactly what we did, so the plan worked,” Clark said. “I think if we practice straight [and] we practice good, we might shock the world,” Taylor said.